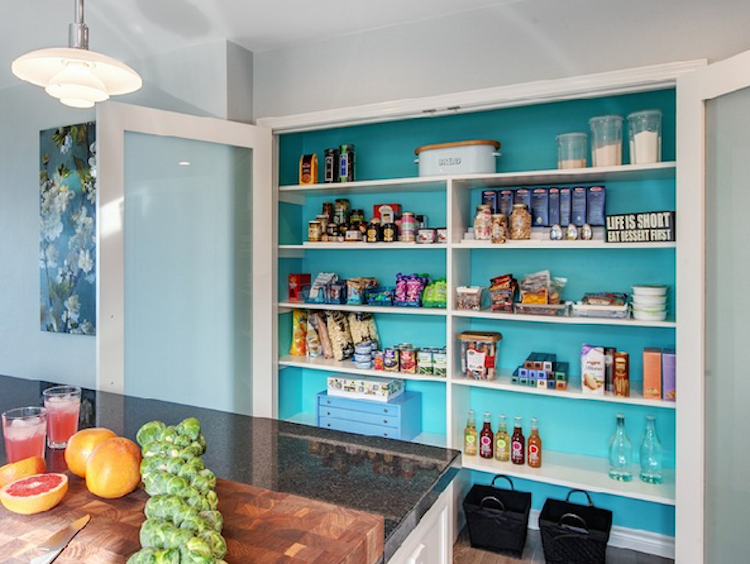 Do you ever get the urge to do something bold in your home? But then something else comes up and you decide to play it safe (or forget about it). I love having a neutral palette to work with but I also love seeing pops of color – especially where you would least expect to find them. I’m sharing a few ways you can add a touch of color to your everyday life without being risky. 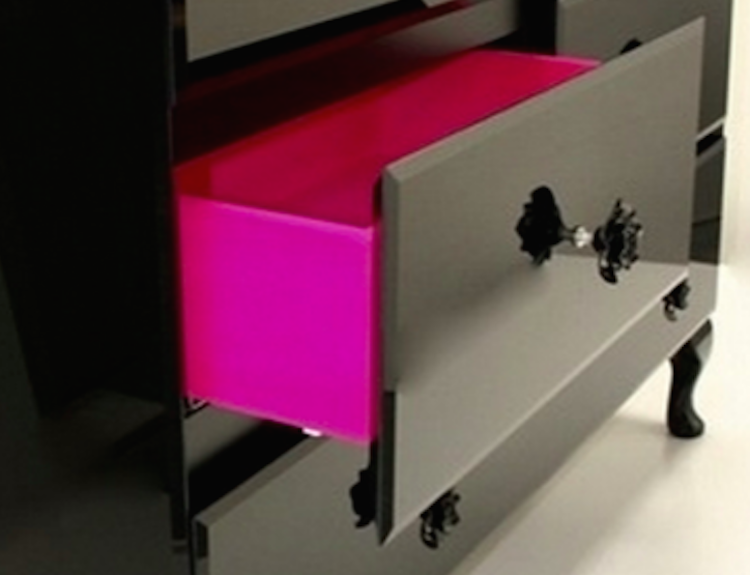 Thinking “inside” the box so to speak – or more specifically inside drawers, cabinets and more places that you can have a bold look without changing the overall look and feel of a space. Just add a little oomph! 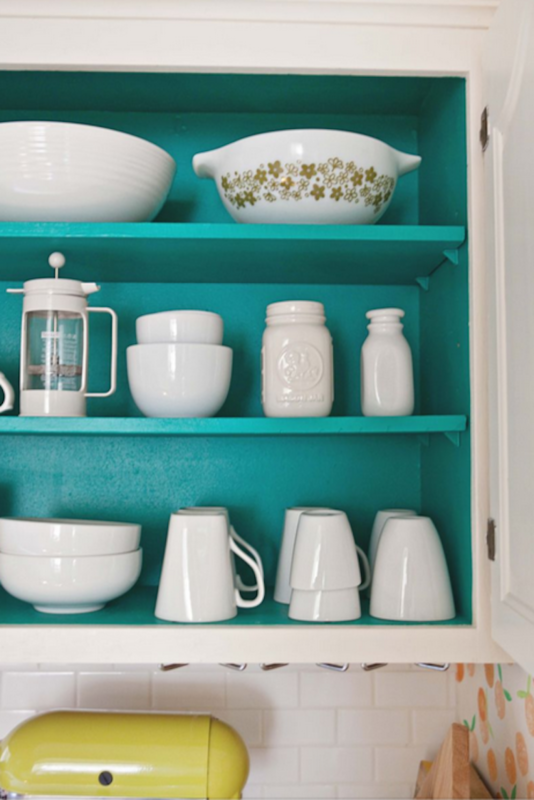 I love how Elsie Larson, of A Beautiful Mess, painted her kitchen cabinets this bold teal while leaving the exterior white. A bold backdrop to her white dishes (above photo). The doors in our house are painted white, the front and the back but the inside is still black from before. I’m not sure if this was done on purpose of not but I like contrast. 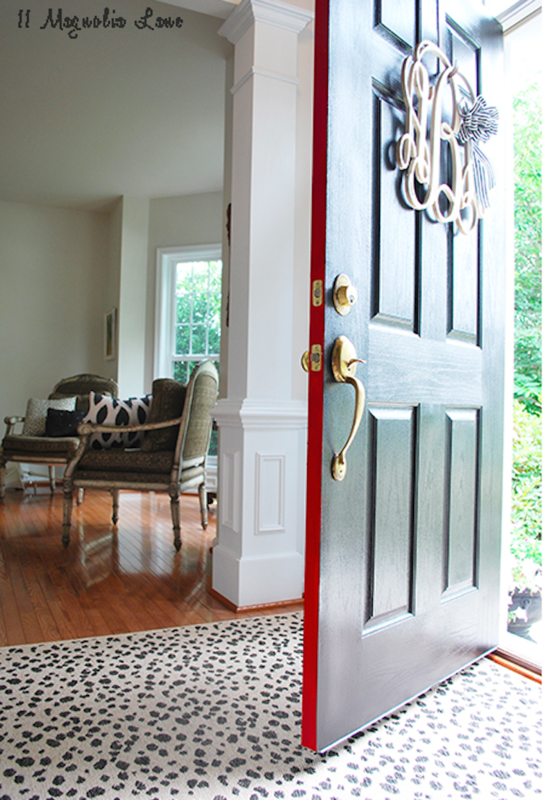 I’d love to go even bolder and try a fun, bright color like this one that Amy from 11 Magnolia Lane did. You would never even notice until the door is open and who doesn’t love a little surprise? Take note, if you are going to do this, take the proper painting steps to make sure your door doesn’t end up sticking! Some tips and tutorials can be found here. We just moved in to a new house and I’m currently making a few updates to some pieces myself! I just switched out the hardware on a couple dressers which have made a huge difference. 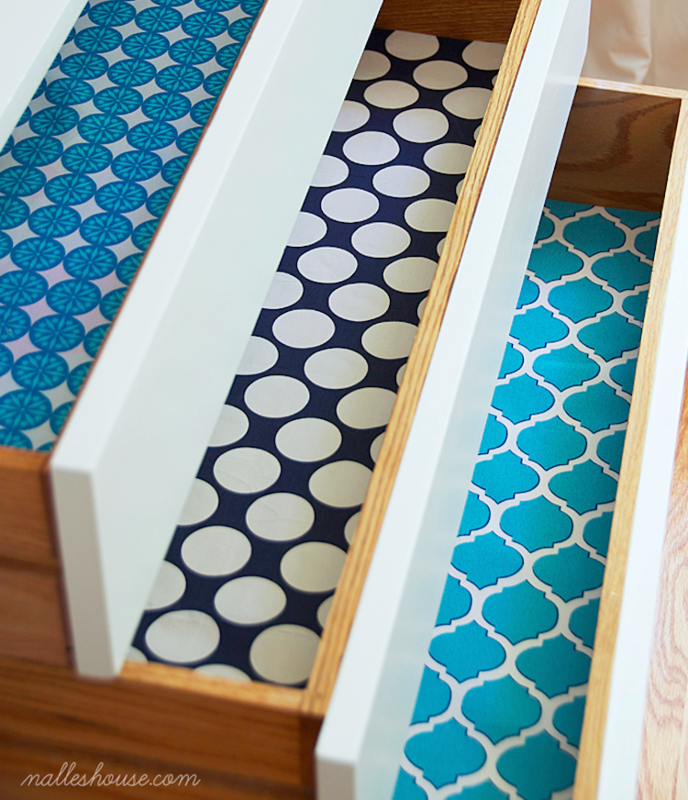 If you aren’t quite sure about pulling out the paintbrush just yet, try shelf liners, fabric or wallpaper. I just ordered these scented peony liners for an old dresser we are fixing up and this liner for our kitchen shelves. I can’t wait until these projects are complete! 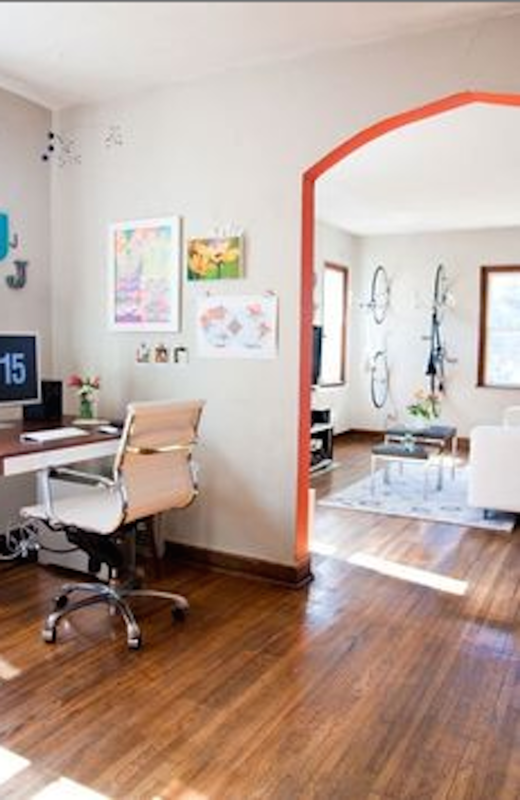 Where else can you add a little pop of color in your home?